The first stand that I headed to and one of the primary reasons for my attendance at this festival was that of the Butcher and Burger (website: http://butcherandtheburger.com/). I have really meant to visit their store at 1021 W. Armitage Ave for some time now, and really don’t have any valid excuses, especially as it is just off an El Stop at Armitage. There were two choices on offer and I went for their “Four B’s Burger”. This was a 4 oz slider of Bison Burger, Bacon, Blue Cheese and BBQ sauce for $7. Yes this really hit the spot. 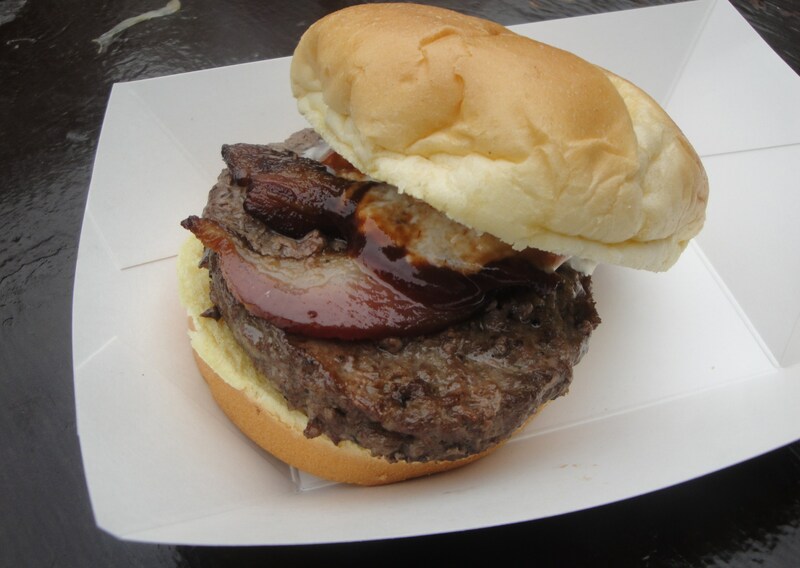 A great bit of bison burger, crunchy almost chewy bacon, and to top that the mixture of cheese with the bbq sauce gave a nice tangy tart taste mingling into each bite. Everyone around me said this was the best burger that they had tasted so far. Although it was my first, I suspected I wasn’t going to get a better one and was tempted to cut my losses and head off elsewhere. I have no reason not to go to Butcher and Burger now, in fact I the juices in my mouth are flowing thinking about it as I write.